Be it by plane, train, or automobile, getting to Missouri River Country is a breeze. Here is all you need to know about making your way to Northeast Montana. Flying is the quickest way to access Missouri River Country. Cape Air operates within Missouri River Country, as do several private charter options. Glasgow’s Glasgow International Airport and Wolf Point’s L. M. Clayton Airport both provide essential air service to Northeast Montana from Billings-Logan International Airport via 9-passenger airplanes. Amtrak runs straight through Missouri River Country on its route from Seattle to Chicago. Stops in Glasgow, Malta, and Wolf Point allow multiple, easy access points to Northeast Montana on your Montana adventure. Take in the stunning views of the prairie from a unique vantage point. Start planning your Amtrak journey here. U.S. Highway 2, Highway 200, Highway 59, U.S. Highway 191, and U.S Highway 85 all run through Missouri River Country, connecting you to the rest of Montana. Highway 200 goes all the way through Montana’s Missouri River Country from east to west. Highway 59 enters our region from the south (from Miles City) and joins into Highway 200 at Jordan. And the best part about driving in Northeast Montana is less traffic, which means there is more time to soak in the sites and sounds along your journey. 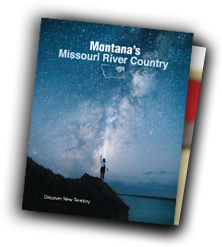 Missouri River Country has four ports of entry from Canada into Montana that can be accessed with valid passports. Be mindful of changing time zones as you cross in and out of Canada and the U.S.